To make GST payment, GST payment challan must first be generated from the GST portal. Once the payment challan is generated, payment can be made by internet banking, credit/debit card, NEFT or cash payment at designated banks. 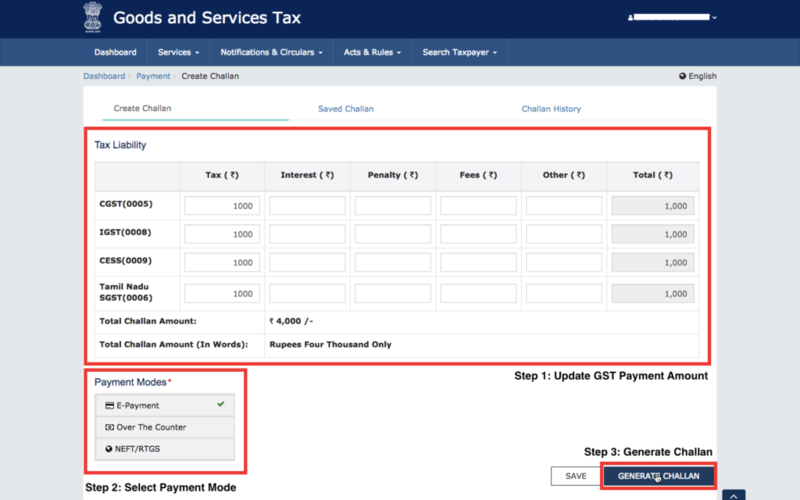 In this article, we look at the procedure for creating GST payment challan and making GST payment. Over the Counter payment through authorised banks for deposits up to ten thousand rupees per challan per tax period, by cash, cheque or demand draft. The following banks have been authorised to accept GST payments on behalf of the Government. Taxpayers can generate a GST payment challan and proceed to one of the following banks for payment of GST by cash, cheque or DD. You can follow the steps below to easily crate a GST payment challan. Creating a GST payment challan is the first step in making GST payment. Step 1: Login to the GST Portal. Sign in to your GST account on the GST portal. 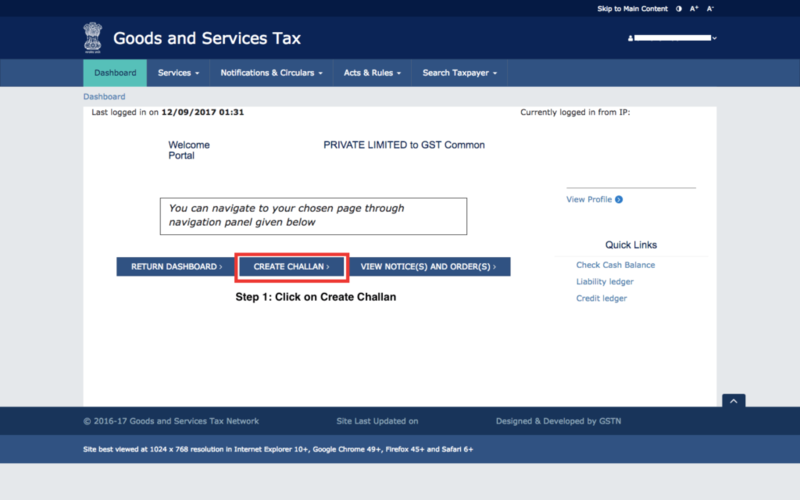 Click on create challan in the GST dashboard. 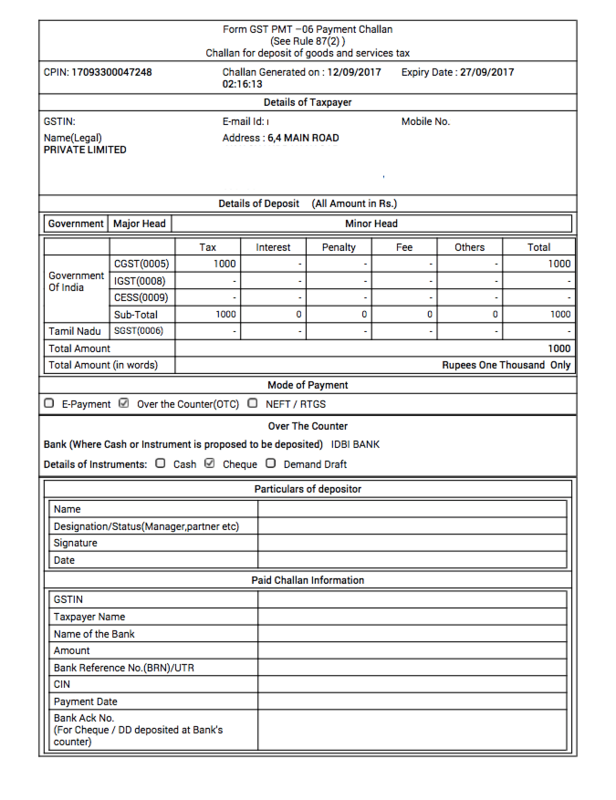 In the page shown below, enter details of GST payment you would like to remit. The amount must be provided under the heads of CGST, IGST, Cess and SGST. Further, the breakup of payment made towards tax, interest, penalty, fee and others can also be mentioned. Select the mode of payment from the payment modes option. Once all the details are mentioned, click on Generate Challan. In the next screen, verify details of payment and click on make payment. In case of cash payment, a GST payment challan as shown below will be generated. The payment challan can be produced at one of the banks mentioned above to make over the counter payment.